If it wants to get serious about winning power, the Labour party must confront the changing nature of its social base. 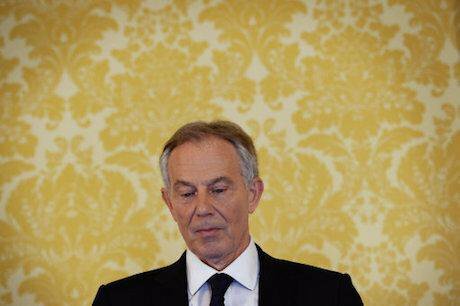 Former prime minister Tony Blair. Photo: Stefan Rousseau / PA Wire/Press Association Images. All rights reserved.There is an irretrievable weakness in the UK Labour party. This is not the obvious weakness, that since the 2015 General Election the party is indulging in insularity and its own abject implosion. Rather, it’s that Labour is not concerned with strength, courage and the acquisition of power, and the consequent use of power to make material improvements in the world. What unites Labour at the moment is that the so called ‘Blairites’ and ‘Corbynites’ do not take power seriously. In contrast, The Conservative party is very serious about power and its maintenance. Power is instrumental and to be used to command the resources of capital, media and finance. The Tories most certainly do not attain power for power’s sake. The most obvious example of this is the ‘first past the post’ electoral system. Much of the Left want to abolish FPTP in favour of more representative proportional systems like AV or STV. However, the Tories are simply not going to abolish this, not now, not ever, since it serves them exceptionally well, consistently delivering over decade-long majorities. With these majorities they attain power, and implement far-reaching societal changes. Ask the miners, or anyone in the North of England who can remember prior to when Tony Blair’s proto-millennials were born. Political power is never ever power for power’s sake: power is always wielded. It cannot but be weilded. In power, Blair, the great bête noire of the left (it must be nice to have your own personal bête noire) and his government, continued this tradition. Blair built a coalition around public sector workers, union support, and by injecting just the right smidge of solidarity into enough aspiring politicians in marginal constituencies to make them feel relaxed with the targeted redistribution of social benefits. (Yes, that was done in your name). Notwithstanding the Iraq war, student fees and augmenting Tory-inaugurated Private Finance Initiatives, some of those far-reaching achievements include increased NHS funding, Sure Start Nurseries, Working Tax Credits, the intervention in Kosovo, the brokering of the Northern Ireland peace accord, and lifting hundreds of thousands of children out of child poverty. How these have not contributed to improved material conditions of those living in Britain and abroad is difficult to see. The point is the Labour party does use power from time to time, in the material war of political governance. The compromises of parliamentary power, and the management of an ever-fractious Labour party limits the capacity to extend the use of power widely. The problem with the new incarnation of Labour is that its principles do not coincide with the productive capacities of power. Seeing politics as not power-laden is a problem. Therefore, whether power produces injustice or justice is down to which party wields it. Power enables good things to happen. Power, as Michel Foucault showed, is neither good nor bad in and of itself – but productive. The compromises of parliamentary power, and the management of an ever-fractious Labour party limits the capacity to extend the use of power widely. Currently, it is primarily the Corbynites in Labour, and their fellow travellers, who are most unserious about strength and power. Power is required to make material changes in the world to make it a better place. Even the most prolier-than-thou Marxist acknowledges that power is a struggle and a fight, it is not a principle. If political power is the ability to dispense favour and benefit, then the current iteration of this new Labour, as manifested through the leadership of Jeremy Corbyn, is coming up short. The struggle for power would sully any effort to improve the lot of human beings in the UK. Sadly, this is considered a virtue on the left flank of Corbyn’s soft-leftism. Corbyn is considered a ‘man of principle,’ and well he might be; he may be someone elevated above the slick spin culture, and the cut and thrust horse-trading that defines the business of Westminster parliamentary politics. Taken to be compliments, these characteristics lead to a distinct problem. This high-minded Victorian moralism is divorced from improving the material conditions of economic life, as it was in Victorian times. In terms of the acquisition of power, Corbyn, for his entire career in politics, is comfortably steeped in the various splits and divisions which are part and parcel of Labour party history. It is not a stretch to say that the concept of power acquisition is mostly based around failed internecine power grabs within the Labour party. Even his leadership victory had the air of the accidental. It is not surprising therefore that this behaviour is replicated on a grand scale within the body politic of the Labour party membership, and manifested in the current leadership selection. This is also, to be fair, why Corbyn has responded with estimable calm to the recent Parliamentary Labour party vote of no confidence, and the subsequent leadership challenge of Owen Smith. This is just another one of those daily splits for Corbyn, the Labour party just does that, in its perpetual back and forth from soft centre-left to the hard centre-left which Corbyn represents. This is the norm. However, how this relates to harnessing the productive power of state institutions, bringing institutions under democratic control, quelling thoughtless capitalist innovation, and the long-term investment in the capacities of human labour is unclear. When Corbyn is criticised as a dim-witted authoritarian, trapped in his bunker, it is really a rather superficial criticism. Corbyn is the post-modern politician par excellence, and is a natural successor to Tony Blair as leader of Labour. While Ed Miliband offered a unified if muddled one-nation Labour vision, Corbyn is a chameleon. He is both authoritarian and a perma-splitter, social media savvy and a communications disaster, he exudes Zen-like calm and haplessness, he is a dissident protestor and an elite prime minister in waiting, he is a walking peace placard at the boisterous PMQs, the leader of a plural, ribald social movement and the leader of a sober consensus-based parliamentary party. He is pro- having his caking and eating it too, as Boris Johnson put it. That these tensions might deliver power in the form of a parliamentary government, which let’s be clear is Corbyn’s express aim, is unlikely, as postmodern fragmentation is for the benefit of those who rule, rather than the divided and ruled, which explains the #toriesforcorbyn hashtag on social media. Corbyn’s stewardship of Labour is of a piece with the history of the Labour party in the 20th Century. The Labour party, historically, ends up doing some right-wing things when it achieves power. This was the case with Atlee and the arguably inevitable post-war imposition of austerity, with Harold Wilson and Barbara Castle’s effort to impose draconian Union controls, with James Callaghan acknowledging the realities of global finance with the management of inflation as the new standard for managing political economy. Tony Blair and Gordon Brown, prior to achieving office, signed up to Conservative spending plans. The distinguishing feature of the Corbyn leadership is that it has managed to do this in opposition. Prior to Corbyn’s ascension to leadership he ran on a moderately soft-left platform of anti-austerity, rail nationalisation, people’s quantitative easing, a National Education Service, and international anti-militarism; basically things which social democrats can set their clocks by. His current Leadership selection platform pledges £500 billion in economic investment. However, in opposition, these policies have been either shelved, watered down, forgotten or U-turned. Notwithstanding opposition to cuts in working tax credits, itself a Blair/Brown policy, there are several examples of this rightward drift in UK Labour’s policy platform under Corbyn. The immediate call to trigger Article 50 without delay after the Brexit referendum, not voting on Trident at the party conference in September 2015, and above all John McDonnell’s affirming the role of the Office of Budget Responsibility (effective acquiescence to the imposition of austerity). The Corbyn/McDonnell duopoly at the head of Labour is really nothing more than Milibandism with bells on and better spin; more Little Blue Book than The Communist Manifesto. It is in the tradition of attempting to stymie and put the brakes on capitalism in the interests of some of the working class. The current fissure within the Labour party is posed as a binary between ‘True/Old Labour’ and the ‘Blairism’ in power. Corbyn is posed as a salve to this division, healing the division between the democratic grassroots and the parliamentary machine. Richard Seymour offers one of the more imaginative left-leaning diagnoses of the state of Corbynism, arguing that there is fundamental contradiction between a parliamentary led Labour party and the desire for a grassroots movement such as Momentum. It is not that Corbyn is the future of the Left, what is most important is that the Left has to recognise that the paths Corbyn has opened up are the way forward. Seymour argues this is a decisive historical moment, since the maintenance of power has moved away from union leadership, the managerial cadre of the PLP and its attendant political professionals. Party membership was never involved other than following the diktats of an elite professional political class. Seymour is right in his diagnosis; he is wrong that this is a new and decisive moment. It is not new: the contradiction in social democratic parties between top-down organisation and bottom-up civil society, or what sociologist Richard Sennett calls the Political Left and the Social Left, can be traced all the way back to industrial battles throughout Europe in the late 1800s. Seymour is correct; the way forward has to resolve both of these positions, and urgently needs to move past the passivity Corbyn’s politics engenders. The danger is that this requires moving from a minority position to a majority one, since small social groups like Momentum, or even the membership of the Labour party as a whole, become enmeshed in local and fragmented positions, without thinking of how one can counter big power with a broad and meaningful narrative of social justice. the maintenance of power has moved away from union leadership, the managerial cadre of the PLP and its attendant political professionals. The most peculiar consequence of all this fragmentation and polarisation is that the Overton window has moved so far to the right that now diffusion, plurality, unresolved contradictions, ad populum instead of populism, and how one feels about things generally now counts as socialist. In terms of the acquisition of power, the idea that the Labour party is going to create an extra-parliamentary socialist revolution/movement within parliament is dubious, and it is neither factual, possible or really an actual thing. Many on the ‘Corbyn-left,’ not without reason, perceive this as the last chance ever to achieve an actual socialist government akin to the Atlee government in 1945. This is where the desperation and hysteria surrounding Corbyn’s leadership emerges; cooler heads are not prevailing. This is it: the last chance for socialism in Britain. It is why socialism, and the very being of ‘being-Left’, is channelled into the lightning rod that is Jeremy Corbyn. The alternative is perpetual condemnation to some form of mild Toryism. Corbyn’s followers are right, the stakes are exceptionally high at this moment, however that this is an august moment of historical significance the Left must win is not the case, though it would be nice. The progressive Left will always have to fight – as demonstrated by, well, all of its past. History is never on the side of the Left. The reason for that is, well, history. However, the desire to return to a prelapsarian idyll, as the Labour party responds to the material conditions in the 21st Century, severely hampers its ability to respond to what is in effect a broader crisis of international capitalism. Brexit voters’ contradictory cry of ‘taking back control’ is a symptom of the immiseration visited on sovereign countries by global capital. This was nowhere more in evidence than when Syriza in Greece had the temerity to unmask International Capital; it quickly became clear that despite the courageous Oxi vote, the ability of sovereign social democratic governments to undermine the interests of international finance is severely limited. These are desperate times for social democracy. This desperation has its roots in reality, and this is why those who oppose Corbyn and his followers simply just ‘don’t get it.’ What motivates Corbyn and his followers is alarmism – the delicious prospect of an impending political apocalypse cannot be resisted, since with the apocalypse comes a messiah. This is all-important, a critical historical juncture more important that the invention of the second wheel, and much more sacred than the ugly business of using power to materially construct a better world from whatever resources available. It is unambiguously unfair to tar the followers of Corbyn with the brush of cultism, but there is the sense that this messiah has come at a time of crisis. The more exacerbated the crisis, the more intense the desperation. The truth is, however, that this is a rear-guard action, a backward-looking response revisiting lost battles rather than a prudent, and forward-looking economic plan to democratise the masses. The Labour party thus faces a horrendous contradiction. There is a swathe of support among members for a grassroots bottom-up social movement that will implement the big state projects have previously been delivered by parliamentary politics. These contradictions need to be faced down, as Owen Jones recently observed. This is difficult, principally because the Corbyn effect operates under a frankly conservative desires to keep things the same, as well as a careless disregard for the effects of Tory management of the United Kingdom. Corbyn is seen as the last hurrah of the politics of the Welfare State, and we may as well go down standing up as sitting down. This is marked by a profound nostalgia for a past where the NHS was fully functional, students had free education, everyone lived in unpurchased council houses, unions worked in polite harmony with the government, and those in poverty had a safety net. Obviously laudable achievements and aims, but as the restoration of the welfare state slips further from sight, the more frantic the desire to preserve it. As the psychoanalyst Jacques Lacan purportedly put it, responding to 68 student protestors: “As revolutionaries, you are hysterics who demand a new master. You will get one.” And right now the disciples of a Corbyn-led Labour party will too. Following the philosopher Giorgio Agamben, the United Kingdom is now entering a state of exception. If negative economic indicators and rising xenophobia are anything to go by, the resurgent pragmatic conservatism of Theresa May will respond to an unpredictable Brexit economy with a raft of exceptional measures for an exceptional time. Strong leaders are valued in precarious times; an emergency narrative will be more unifying in maintaining power than the very local and feudal turf wars of the Labour party. In addition, we will see a further devolved and fragmented UK, where on both Left and Right fragmentation will be cheerfully lauded as some kind of feudal democratic liberation, when in fact it will mean the undermining of the equal distribution of resources. Fragmentation has never lead to liberation. Ultimately the Labour party is not an end in itself, it is only a blunt instrument in the class war between those who conserve wealth, and those who spend it. Make no mistake, this is a question of power and nothing else, because a fight for power if anything is at the core of the history of the Labour movement. One way or another the stakes of this for those who benefit from progressive politics could not be more severe.